Here’s one you don’t see often – a plug filler Swan! This was originally a Mabie Todd and Bard design and it was continued on after the company became Mabie Todd in 1907. This pen is stamped “Mabie Todd & Co” on the barrel. As the feed is stamped MTB that suggests that it was made very soon after the change in the company name, when earlier parts were still being used up. Well more than 100 years old, anyway, and looking like new. This is an eyedropper filler but instead of unscrewing the section to fill the pen, the plug is withdrawn to allow filling with a very slender eyedropper. 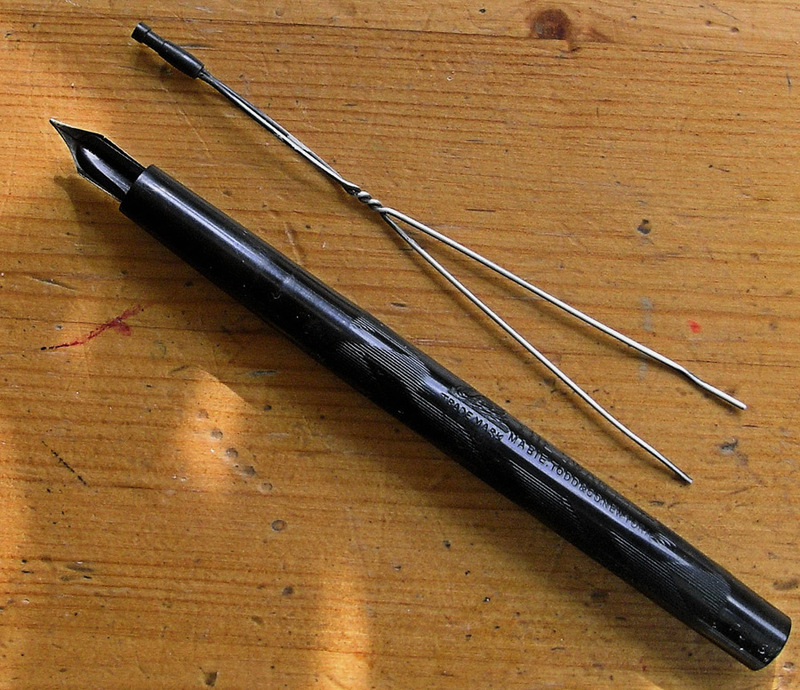 This method does not seem to have caught on as there aren’t many pens of this type around. Perhaps it became unreliable as the plug wore with much use or it may be that it was less expensive to revert to the screw-in section. This must be the longest twisted silver wire that I have ever seen! I have no doubt that it did the job of improving ink flow just as well but these became much shorter as time went on. It is remarkable that the black hard rubber has retained its original darkness and shine so well for over a hundred years. Is this the earliest appearance of the gold overfeed in Swans? 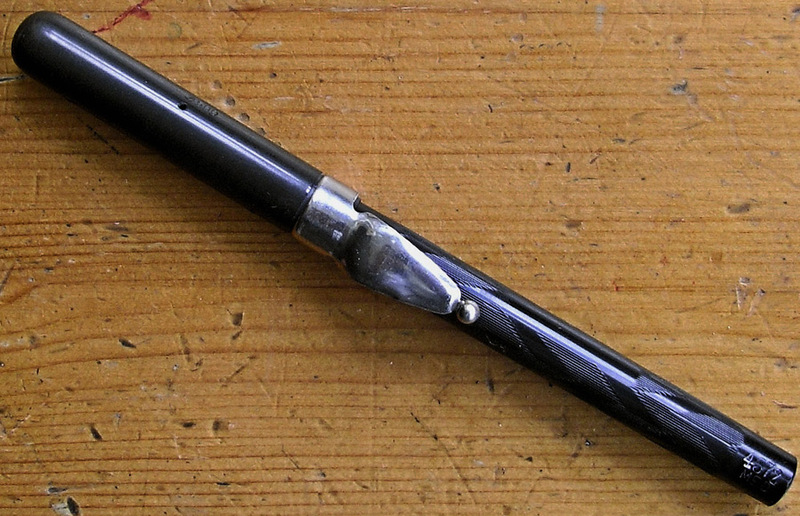 Many thanks to Paul Leclercq for sight of this splendid pen and permission to write about it. I recently bought a pen similar to this, but apparently somewhat older. It was sold as an eyedropper, and I was bemused to find when I unscrewed the section that long twist of wire, which does not feature on the only other eyedropper I had hitherto had experience of, ‘Nor’s Swan 1500’ which you sold me some time ago. When on seeing this entry I re-examined the new acquisition I found the plug, which I had not noticed before. It is firmly stuck in place, and there is a small nick in the section alongside it which suggests a clumsy attempt to remove it, so I am leaving it there. The description – the cap, which has faded to chocolate, has the Swan trade mark and 1500, still picked out in white, so possibly not the original though it is a good fit. The engraved barrel is still shiny black except for a small area between the section and the first of two (scarcely) gold plated bands which has faded slightly. The barrel engraving includes the Swan trade mark with THE SWAN PEN PAT. OCT. 2’86 MAR 6.88 JULY – and possibly something else which is no longer legible. Below that MABIE TODD & BARD NEW Y(worn away). At the end beyond the second ring 4671 MB. There is nothing discernible on the section, which is rather scratched, though still shiny. The nib is marked BROAD POINT (assuming the central letters hidden by the gold overfeed) and is cut as an italic or stub, is fairly rigid though there is a slight but genuine flex, and writes without pressure with beautiful line variation. Afterword – I then found that Nor’s parts were firmly stuck together, searched yours always helpful site and eased them apart with what seemed a frighteningly ungentle blast from the hairdryer. Even though it may be something of a Frankenpen, that’s a very interesting and rare pen. I suspect that 4671 is a nib code rather than a code for the pen. It sounds like a truly delightful nib! According to my book, 4671 would be a medium broad nib in a 4600 series pen – i.e. with bands or chased end caps unlike mine which of course is plain. 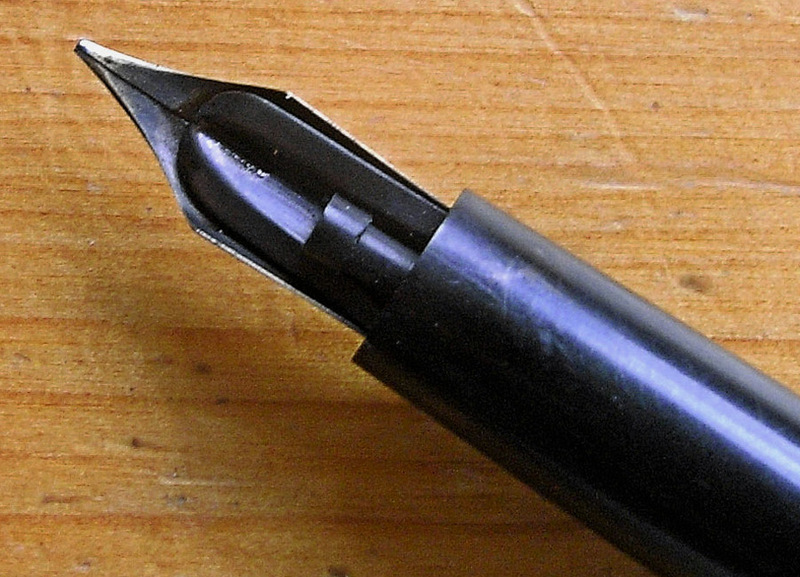 The nib would be a size 3 (the plug feed was fitted to pens with size 3 and 5 nibs.